The tournament that I've had my eye on all season long finally arrived! I headed down to La Crosse, WI to begin prefishing on the Mississippi River for the Everstart Central Division event on Saturday the weekend before the tournament. The open pools for this event were pools 7 through 9, but because of the short fishing days and only being a 3-fish limit per the WI DNR rules, I decided I was going to focus on the Lake Onalaska portion of pool 7 and the south end of pool 8. My first two days of prefishing were very beneficial to me, for several reasons. One, I was able to find areas on both pools that were holding fish. Two, I did catch some fish that were in that much need 3 lb. range and lastly, I was also eliminating much dead water. Going into the first day of competition on Thursday, I knew that for me to stay competitive I would need to weigh in at least 8 lb’s and that ideally I would need to be shooting for that 8.5 to 9 lb. mark and I felt with the practice I had I could hit this range and with one kicker bite, I could easily be pushing for a top ten spot. On day one, I locked up to the Lake and started throwing a swim jig and Carolina-rig on a weed line, but that yielded one small keeper for my co. My second spot did hold fish, but not the size I had caught in practice. I was fishing a grass/lily pad bed that had current running alongside of it and throwing a Snag Proof Bobby’s Perfect Frog, which put together a quick limit for me. Shortly before midday I decided to lock back down to pool 8 in hopes to upgrade my catch. I fished several main channel spots, but had no success, so I ran to a backwater area that had current and wood and picked up my tube rigged on a Trokar Tube hook and began flipping every possible inch of cover. Not too long after arriving in this spot, I stuck a nice 3 lb. fish and instantly the wheels started turning and was on the lookout for another key fish. Another strike, this time a 2.5 lb. fish! As the time ran out for the day, I finished with a 3-fish limit for 7 lb. 15 oz. and was in 52nd spot, not what I had hoped, but I didn't shoot myself in the foot and was primed for day number two on Friday! 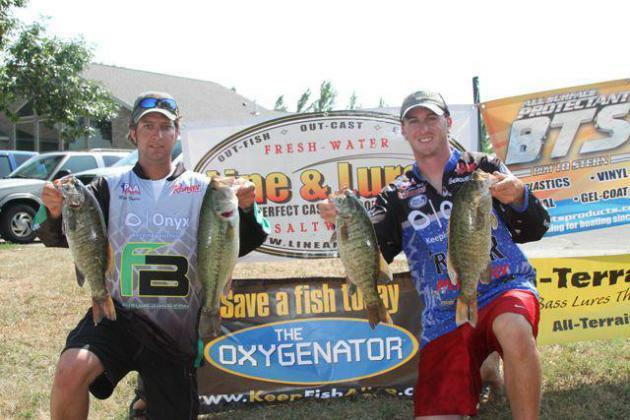 Since I had burned my water on day one up on the Lake, I decided to run south on pool 8 on Friday. Armed again with my Snag Proof Frogs, Wright & McGill frog rod and Seaguar Kanzen Braid, I casted to and worked my frog around miles upon miles of vegetation. The number of fish I caught was more than on day one, as I slowly began upgrading my limit. With every cull I made, I knew I was inching closer and closer to hopefully cashing a check in my first ever Everstart event. I also knew that anytime I could get a 4 lb. plus fish to bite and I could catapult close to the top ten cut. As I crossed the stage I was hoping that my limit would be enough for cashing a check, as the scale settled, I again weighed 7 lb. 15 oz. and I knew that it was going to be close to the check line. After the weigh in had been complete, my two day total of 15 lb. 14 oz., put me in 50th place and just 8 oz. from cashing a check. This was a disappointing result, but I stayed competitive, learned a lot and had fun fishing this triple a level event, against some stiff local sticks and national touring pros. On to the next tournament and hope that big bite comes, right?! Please check me out and follow me on my new Facebook Page. The first of my BFL tournaments for this season has passed and it was a good learning experience for me and despite not cashing a check, I took several positives from the day. I had a great time on the Mississippi River all week and look forward to my next tournament down there. The first positive and in my mind is very important is that throughout prefishing I kept my nose to the grind stone and looked for the areas that had the quality fish that were needed to do well in a 3-fish limit tournament. I focused primarily on largemouth, but did find a few big smallies, which is always fun to tangle with! My main pattern for this tournament was fishing Snag Proof Frogs around matted vegetation and lily pads. I definitely put countless miles on my Minn Kota Fortrex trolling motor as I had to cover a lot of water to find the right water and size of fish I was looking, but once I did the fish were bunch up, so I would drop my Minn Kota Talon, so I could fish for them effectively. Getting the bass out of the heavy vegetation was key, as I knew the big bites would be limited so I put my Wright & McGill Tessera Series Frog Rod and Seaguar Kanzen 60 lb. braided line to test and it performed flawless for me. I finished the tournament with 7 lb. 15 oz., which put me in 49th place out of 110 and I can say that I capitalized on the opportunities I had and stuck to my game plan and put myself in the position to do well. My co angler did manage to get a 4 lb. fish to bite that I worked a long time on, so I was happy for him, but at the same time, that fish would’ve moved up into the top ten, but hey that is fishing and some days you get the bite and other days you don’t. Following the BFL, I headed back to MN so I could fish the third Big Bass Bonanza event of the year on Lake Minnewaska. As I said above, some days you get the bites and some days you don’t, well Sunday started out slow and looked to be a grind it out day of fishing. But then Nick hooked up with a big largemouth, which jolted our confidence. We then went to plan B to target smallmouth and the lights came on and things started to click. We used a variety of soft plastic baits on Trokar Extra Wide Gap hooks and because of the finicky bites, we used 15 lb. test Seaguar TATSU Fluorocarbon line. Once we had established our pattern, we used the Lakemaster chip in the Humminbird Electronics to help identify other potential fish holding areas; this helped us make better use of our day. 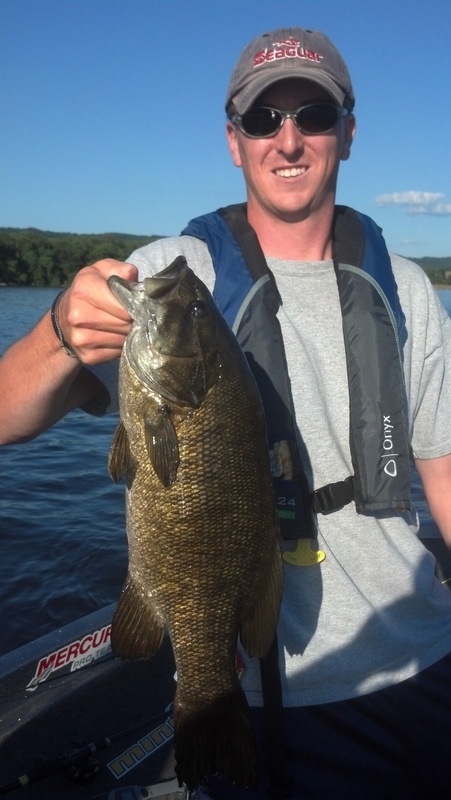 Our 8-fish limit comprised of seven smallmouths and a 4.79 lb. kicker largemouth that took big bass honors and our limit weighted 25.25 lb’s, and put us in 2nd place! This was a great feeling to cap off the weekend and help us gain some valuable points in the year end standings as we head to the final event of the year on August 26th on the Horseshoe Chain. Well, I’m back off to the lake this week for the Denny’s Wednesday nighter and then head down to La Crosse next week for the Everstart, please be sure to check out my new website for daily updates, glennwalkerfishing.com.